Icelandic New Energy is mostly involved in demonstrational and research projects. 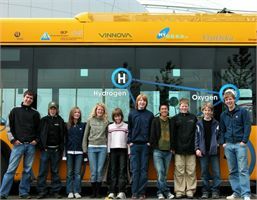 The Hydrogen business has not reached its maturity so INE is still building up a knowledge base and offers consultancy. The company has experience from operating hydrogen service systems including FC buses (2001 – 2007), passenger vehicles and sedans since 2007 in addition to a boat unit. A stationary FC application as a backup power systems is also on the list of achievements. The company can give advice and consultation to those who want to launch their own hydrogen systems. Perhaps a good start is to attend a presentation at our company. The company has also, the past few years, been researching other parts of the electrictransport. Since 2010 the company has been testing Battery Electric cars (BEV’s) to test their endurance and range in Icelandic circumstances. Also, the company is involved with other Scandinavian partners in testing battery powered boats. Furthermore, we have created networks for those working in electric transport sectors. Seminars are available for groups (see link to the right) – they can be adapted to students, interest groups or experts. Ask for directions at your hotel. For transport with public buses look up: www.bus.is (Buses no 2 , 14, 15 and 17 stop in the neighborhood).